Some years after Bill’s death, Allen Temko, the longtime architectural critic of the San Francisco Chronicle and modernist devotee, reminded me of one of his favorite celebrity lines: “Bill Pereira was Hollywood’s idea of an architect.” He was, of course, referring to Bill’s lifestyle, his statuesque figure, his penchant for Bentleys and Lear Jet travel, his preferential dress in black and white, and the perennial blondes and British that seemed to surround him. Allen’s remark, an acerbic and sly bullet was aimed to kill, but as I have revisited it over the years I find that perhaps like all intended truths in a postmodern world, it may have a greater meaning than the one which Allen intended. Bill and Allen had gone to war in the early 70’s over San Francisco’s Transamerica Pyramid, and the forward march of time and ideas was finding Bill’s intense nostalgia for the future neatly matched by Allen’s growing nostalgia for a modernist past. Bill Pereira grew up in Chicago, where following an architectural degree at the University of Illinois, he joined the office of Holabird & Root, helping to masterplan the 1933 World’s Fair. Joining his brother, Hal, an artist and designer, they soon created Pereira and Pereira, latched onto movie theatre design in the days when film studios controlled their own national theatre chains. While still in their 20’s, he and Hal designed dozens of movie theatres and interiors across the country, among them the landmark and high style Esquire Theatre of Chicago. 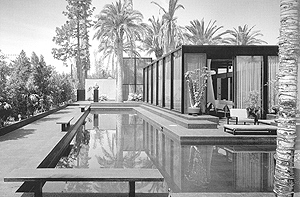 Relocating to Southern California in the late 30’s following a move by his brother, Bill continued his work as an architect while also acting as a production designer for Paramount, RKO, and David O. Selznick. In 1942, he received an Academy Award for “Reap the Wild Wind.” In a balancing act which must have been exhilarating, Pereira was also designing the Lake County Tuberculosis Sanitarium in Wisconsin which received a Museum of Modern Art Award in 1944. Throughout the late 40’s, Bill’s work grew in diversity, anchored in a growing post-war Southern California where autos, aerospace, movie studios, corporate culture, and the emerging presence of television were centered. In 1950, joining his former classmate from Chicago, and the prematurely retired CEO of Lever Brothers, Charles Luckman, Pereira and Luckman was founded. Billís involvement with the studios led to the commission for CBS Television City in central Los Angeles, while Charles’ New York presence led to an initial scheme for Seagram’s Park Avenue headquarters. That scheme was, as we now know, famously overtaken by Phyllis Lambertís involvement and familial connection and the subsequent decision to commission Mies Van der Rohe with Philip Johnson to design the building we know today. For a brief period, until 1958, Pereira and Luckman seemed to garner enormous and significant commissions. Their office grew to 300 architects, overtaking the size of other major regional offices such as Welton Becket and Albert C. Martin. By the end of the decade, however, the office proved to be still not big enough for the two of them and they separated, Bill returning for a time to a more modestly scaled practice which included both large scale masterplanning as well as architecture, even as he began a long stint as a studio professor at the University of Southern California’s School of Architecture. It was in this period when Bill Pereira developed his practice and ultimately the work for which he is largely remembered. It was a unique period in the history of California, one in which suburbs were being built at a frantic pace in concert with massive federally funded highway construction programs. Private agricultural lands were being replanned as mixed-use exurban commercial centers while central cities were exploiting broad powers of urban renewal and eminent domain, clearing large and historic downtown neighborhoods such as Bunker Hill. William L. Pereira Associates managed to be centrally involved in the architectural outfall of these regional events while masterplanning activities transported the practice to Cape Canaveral, army bases overseas, and university and medical campuses worldwide. The work of William L. Pereira Associates in its prime was voluminous and diverse. Some of the projects which became highly visible and display the idealism and iconography for which Bill became known include work for Transamerica, a financial services conglomerate which was originally headquartered in downtown Los Angeles in the early 60’s. Looking for a new and centrally located corporate headquarters, Bill had performed masterplanning services throughout the region and was convinced that downtown was the desired location and that the neighborhood today known as South Park was the direction which new development would take. Downtown’s first modern highrise was then built, a modernist confection of glassy ground level spaces, interior gardens, terrazzo floors, luminous ceilings, expressed steel structure, a highly molded curtainwall, and an observatory and all glass restaurant at the top. The building towered over the rest of the city while downtown development suddenly lurched west along Wilshire and 7th, leaving Transamerica to stand in isolation to this day. Some 40 years later, as South Park receives the attention and investment of a new generation, it now seems possible that this neighborhood will intensify. San Francisco ultimately became both the headquarters and the location for Transamerica’s most visible symbol, the Transamerica Pyramid. This design was based on a black model of a similar building designed for ABC on New Yorkís Sixth Avenue. The model sat under a drafting table in the rear of the studio for years. 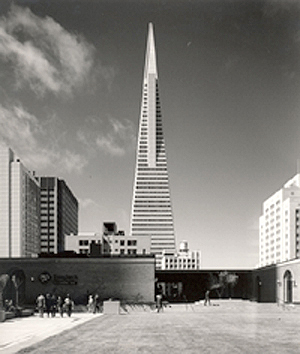 Positioned on axis at the foot of San Francisco’s Columbus Street, the needlelike design for Transamerica fostered a contentious and protracted battle among constituent groups, ultimately leading to its approval and construction. The imageability of the building seemed finally to capture the marriage of a simple iconography and the branding requirements of a large but otherwise invisible corporate culture. The original Los Angeles County Museum of Art was also designed by Bill. The building complex sited in the County Park along Wilshire Boulevard was a meditation on the contemporaneous activities at New York’s Lincoln Center. The nesting of three principal pavilions around a large entry plaza recalls the Manhattan truce called by Edward Durell Stone, Philip Johnson, and Gordon Bunshaft. With the addition of a good measure of decorative lacework and festive lagoons and fountains, the new project sought to morph the surrounding LaBrea Tar Pits into a celebrity work for high culture. Architectural exhuberance asserted the Museum’s ambitions while masking its modest collections of the day. The post-mortem scrum over the design credits for the Theme Tower at Los Angeles International Airport has always amused me. 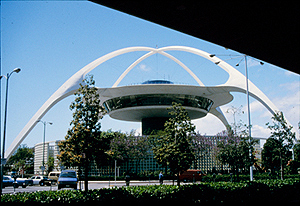 The futuristic praying mantis which hovers above the airport’s middle ground was the product of a joint venture between Welton Becket, William Pereira, and Paul Williams. Strategic and unlikely partnerships for architectural commissions at the airport seem to have been the order of the day then much as they are today. A photo of the completed building always hung outside Bill Pereira’s office and senior architects and surviving airport officials appear to look to Bill as the lead designer for what was finally built, notwithstanding claims from every corner. Certainly the building’s iconic futurism and its stylized and bare-faced optimism embody much of Bill’s work in this period. Finally, the building which has most interested me was always his own house on Rossmore Avenue in Hancock Park. It was featured in the 1963 Time Magazine article on him and has largely gone unacknowledged. It sat on a narrow lot, shrouded by adjacent tree cover and was in many ways a straightforward exercise in International Style volumetrics. Still, the house was decoratively staged with painting and sculpture, window coverings, area rugs, and 50’s style ornamental iron. The lighting was carefully set and mood-defining while the base of the house was again disaggregated from the ground plane by a series of orthogonal reflecting pools. The atmospheric whole was a shimmering cinematic set piece of modernity, acquisition and transcendence. On a street of large houses of questionable historic provenance, Bill had produced in the design of his house, a frame, much as an art director would construct a film. And so, getting back to the stuff of Allen Temko’s epithet, we are reminded how the storyline of an architect’s life is inevitably merged with the history of his contribution. There is little question that Bill tapped into the romanticized zeitgeist of his time with work on tropical islands (Makaha Inn and Country Club), desert landscapes (the Flamingo Las Vegas), the rugged coastline (Marineland of the Pacific and Catalina), and the exhilaration of aerospace, media and world travel. His unique and triangular marriage of personal style, highly narrative programs, and his penchant for achieving an iconic and idealistic moment with his architecture seems to mark him for Temko’s aim. Still, as the impact of European modernism has waned, and frequently urgent but weightless movements have struggled to fill its huge void, it must be said that the omnipresence of cinema, and the camera’s intrinsic nature to scan, to layer, and to present with a kind of amorality, has now irreversibly altered our way of seeing “the facts on the ground.” And it seems possible now, that for its inevitable mortality, the work of William Pereira may awaken a new and younger audience, one accustomed to the eclecticism of the Coen Brothers and Quentin Tarantino, one that finds simple pleasures in modernist diners, carwashes and bowling alleys, and one that sees all works of production streaming lifestyle options and settings, not a moral imperative, nor an answer to all of life’s greatest questions. And maybe Allen Temko’s remark will be proven to be right. In ways he didn’t imagine. Scott Johnson is a prolific designer of residential, commercial and institutional building projects, including three high rise buildings in Century City, California; the Opus One and Byron Wineries in the Napa Valley and Santa Barbara County, respectively; Rincon Center in San Francisco; and the new Capitol Area East End in Sacramento. Johnson worked at The Architects Collaborative in Cambridge, Mass, the Los Angeles and San Francisco offices of Skidmore Owings Merrill and the office of Philip Johnson and John Burgee in New York City. Joining Pereira Associates in Los Angeles in 1983 as Principal and Design Director, he and William Fain acquired the firm now known as Johnson Fain in 1987. In addition to designing nearly 100 built projects in the past 16 years, Johnson has also taught at the Southern California Institute of Architecture, UCLA School of Art and Architecture, and was recently appointed Director of the Masters of Architecture program at the USC School of Architecture. Active in the arts community, he is a Founder of the Museum of Contemporary Art in Los Angeles and serves as a board director of the Collage Dance Theater, the Craft and Folk Art Museum, and a member of MOCA’s Drawings Committee.